Bachelor of Arts degrees permit students to take a broad selection of courses in the humanities and social sciences, including a world language. This type of degree generally is selected by students pursuing professional school, such as medical or dental school. The B.A. 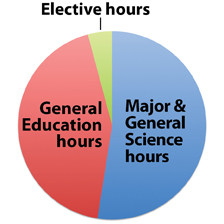 Human Biology major requires that students choose one of five academic concentrations, listed below.